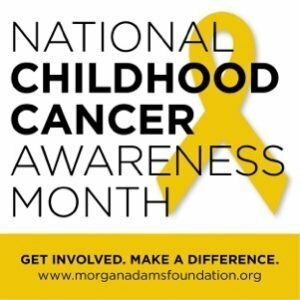 September is Childhood Cancer Awareness Month, a time to acknowledge the thousands of children and their families who are dealing with a cancer diagnosis, raise awareness about the reality of childhood cancer, and emphasize the importance of research. The Morgan Adams Foundation is proud to have partnered with Children’s Hospital Colorado and other renowned research institutions around the world for nearly 20 years to improve kids’ cancer treatments and outcomes through innovative and groundbreaking scientific research. During that time, the foundation has funded more than 160 pediatric cancer research projects totaling more than $5 million. The Foundation is named for Slaughter’s daughter Morgan, who died 20 years ago at the age of six, 11 months after being diagnosed with a glioblastoma multiforme brain tumor. In the U.S., 43 children receive a cancer diagnosis each day — nearly 16,000 per year. That’s 1 in 285 children. Of every eight children diagnosed with cancer, one will not survive. Only 4 percent of National Cancer Institute research funding goes to study pediatric cancer. One hospitalization for a pediatric cancer patient costs more than $40,000 on average. The Morgan Adams Foundation website has additional information, including personal stories of kids with cancer, additional facts about kids and cancer, and updates on current research. Go to www.morganadamsfoundation.org/gogold.